Plan to pluck your ducks and geese dry. According to MDH (my deer husband), they are easiest to pluck soon after shooting. If you situate your ducks/geese over a bag or deep pot, you can pull the feathers down and into the container. Pull down with the lay of the feathers. If this sounds like too much work, I have an alternative. Delta Waterfowl president, Rob Olson has some great videos on cleaning ducks. Don’t Forget the Drumsticks & Thighs – Great info on how to BBQ a Goose! Each of these are 2 to 5 minutes and well worth your time! Before storing your duck/goose decoys, spend a little time checking them over for next year. This tip is from Chuck Barry, President of Texas Hunting Products (in Houston, TX). To repair shot holes, use a short length of polypropylene rope. Touch the lit end of a match to the end of the rope. Dab the liquid polypropylene on the holes. This operation can seal the holes. However, if you check the repair before the area cools, you can use all those cuss words you’ve saved up (for just such an occasion)! * Reflections of Autumn – Wood Ducks Rear Window Graphic used by permission of Vantage Point Graphics! Our Sunday’s Special this Weekend: Western Rear Window Graphic Photos! Then come back for a new article on Monday! ﻿REMEMBER: Deja Moo is the feeling you’ve heard this bull before! Article first published as Using Camo and a Blind When the Deer Aren’t on Technorati. Used properly, camouflage can significantly improve your chances of getting close enough to a deer to shoot. However, camouflage doesn’t cure all problems — all the time. Face Paint, Face Veils & Head Coverings Disguise the Human Form! Whether you use face paint, head veils/coverings or other camouflage materials, they usually do a great job of breaking up your outline. They also help you blend in with your surroundings, thus forcing deer to use his other senses to find you. Bowhunters should locate their blinds about 15 – 20 yards away from trails made by game. Use curved edges when covering your hiding spot, rather than squared edges. It looks more natural. Set your ground blind at a higher elevation than you expect to see game. This takes you out of his direct line-of-sight and usually gives you a wider view. Cover yourself completely; your skin, watch and weapons must be matte. If a deer sees the sun reflecting off the face of your watch — you are toast! Safety is your first consideration — for yourself and other hunters. Here are a few tips so you don’t become accidental prey or hurt others! A bright orange vest/jacket/hat should be worn on your way to your hunting spot. Don’t wear or carry anything that is the color of the game you are seeking. Hang a tag of bright tape on the animal when you are field dressing or carrying game to your vehicle. When you hear another hunter approaching, call out in a normal voice to alert others. Do not shout, use a whistle or use an animal caller. Be extremely careful of using an animal caller when other hunters are in your hunting area. Be sure that you will have a clear shot and that you can see on the other side of the animal — before you shoot. Remember: Safety takes a few extra seconds, but regret lasts for a very long time! Come Back Sunday for a Look at 5 Dynamite Firefighter Graphics! Recently, I wrote an article about finding a wounded animal, Finding Your Wounded Deer. There are so many facets to this problem that I want to attack it from a different angle. Blood Spatters are Important Indicators of the Length of Your Search for a Wounded Animal! Understanding what you are seeing on the trail may help you in finding a wounded animal. Wild animals are not going to help you; it is up to you to decipher the blood spatters. The experts I’ve consulted suggest starting where the animal was hit. They recommend using squares of toilet tissue to mark the trail. Alternately, use plastic flags (and remove them later). Recognizing the exact location the deer/elk/whatever was hit might not be very easy. Before leaving your shooting location, find some landmarks to help you find the correct spot. Knowing where the animal was shot can be a good indicator as to the distance you will need to travel to find the deer or other animal. You might need to get down on all fours to search the area. Sometimes, blood and hair strands cling to the sides of grass stems and other foliage. Blood that is frothy — with bubbles — is probably a lung shot. Conversely, blood with bubbles may be a hit in the neck, with the bullet or arrow opening arteries and windpipe. Blood that is very dark, may show a liver or kidney injury. Blood mixed with vegetation (often greenish in color), usually means a ‘gut’ shot. Blood in a spattered pattern can show an animal that is moving fast or that major blood vessels were severed. The height of the blood sign often tells you the location of the wound. Blood spattered on both sides of a trail usually indicates a pass-through wound. However, this same sign can indicate that an animal doubled back on his trail with a one-hole wound. Generally, knowing what a blood spatter means will tell you how long it will take to find the animal. For example, that frothy blood sign that indicates a lung shot, will probably be a short search. Blood with bits of undigested food (a stomach or intestines wound),will usually take a much longer time. Do you know someone who might find this article useful? Unless you read an upbeat blog like HuntingLife.com – positive news about hunters and anglers can be in short supply. The author of this blog shares with his readers the latest-and-greatest news about outdoors, plus news about the individuals and groups who make a difference. This site has been on my Blogroll for a very long time. In fact, it was one of the first I added because of the incredible range of articles and information. What I appreciate most is Kevin Paulson’s focus on the people and organizations that make good things happen in the American outdoors. Anglers and hunters are the conservators of the fish and wild game available in America today. How? Through the fees, taxes and stamp/license purchases, outdoor enthusiasts fund the state fisheries, parks and wildlife sanctuaries across our land. A lesser-known role of hunters and anglers is the one of land acquisition. Each year, land is donated and/or purchased by individuals and organizations to preserve our sporting heritage for years to come. HuntingLife.com is at the forefront of naming names and giving credit to the folks who give so much to protect and preserve our outdoor traditions. It’s one of those products you might bypass because it lacks a glamorous name or a big-name endorser. However, after reading HuntingLife’s review, this product is on my list to check out the next time I’m in a sporting goods store. Just click on the “Reviews” button (left, under the HuntingLife.com logo) to see (an extensive) list of the evaluated products. Do you have a photo of your last hunting outing? HuntingLife has a photo gallery – and offers to let you share your great moments with the world! Click on the “Gallery” button for instructions to send your hunting photo(s). This brief article cannot hope to cover everything that is available on the HuntingLife site. However, I found a listing on their site that seems to sum things up. hunting guides, outfitters, and hunting lodges. Although I’ve followed TalkHunting.com through their tweets, I recently spent time on the site and like what I see. If you are into hunting – this is a very friendly place. With All the Tips & Hints Flying Around on TalkHunting.com, These Turkeys Should Be Shaking in their Shoes! I’m not sure 400 words is enough room to explain this site! A year ago, they decided to collect wild game recipes for a cookbook and recipes started to arrive. Are you familiar with “Canned Venison/Elk?” I wasn’t. At the bottom of page one, Captain Dale offers the recipe as a pdf file. Put raw slices of meat with some condiments in canning jars. By the time the pressure cooker has done its job, the meat is cooked and processed. Although there are areas of general interest (Announcements & Events; Free Classified Ads, etc. ), there are separate forums for specific hunting interests: Deer, Turkey, Big Game, Water Fowl & Game Birds, Other Critters (hogs, predators, etc. ), and Hunting with Kids. The thing that impressed me most was hunters helping hunters – with tips and suggestions. An example in the “Turkey Hunter > New Turkey Hunter” Forum: Someone new to hunting turkey asked how to get started. Seasoned hunters welcomed the newcomer and shared useful advice. An interesting aside to this site is the fact that hunting product sponsors offer a variety of items to be given away each month! TalkHunting.com has devised a great way to distribute those prizes. Members (yes, you must be a registered member to qualify) must promote the quality of the forum by participating in discussions. You need to offer a minimum number of posts for your name to be added to the pot for the drawings. Additional posts by members mean more chances of winning! I’m a native Houstonian and our family moved a great deal during my early years. Chatting with a stranger has never come naturally to me. In fact, the entire concept of “social media” leaves me cold. However, I’ve really enjoyed lurking (reading, but not commenting)* on this site. I’ve learned quite a bit in the time I’ve spent there. If you are looking for friendly folks, lots of support, interesting stories and photos, this is a great spot. Say … lets lurk together! * Lurking is common for newcomers; you learn how things work, how to comment, etc. Of course, the expectation is that before long, you will want to participate. This is a easy site to get started. ‘Proud Crowd’ is used by permission of ClearVue Graphics! Guess What? Your Mama Was Your First Hunting Instructor! Mom Finally Gets Some Credit! Most hunters do not realize that “dear ol’ Mom” was their first trainer in the fine skill of hunting. Dads came along later, to take the semi-trained youngster to the woods for further instruction. Your mother cautioned you ‘not to make a spectacle of yourself’ – an important hunting tip. Great hunters stay in the shadows – out of direct sunlight. There’s only one word for hunters who walk along the tops of hills with the sun behind them – busted! Mama was right when she cautioned you to ‘quit wiggling.’ No matter how well you’ve camouflaged yourself, too much movement will give you away. Most large game have an acute sense of smell. So, when your Mama told you to take a bath because you smelled, she was offering good advice. This is not a time to bathe with your new bar of “Obsession” soap. Neutral, non-scented soap is the best idea. Hunters planning on stalking in pine areas sometimes store their ghillie wear in plastic bags, along with pine leaves. Those hunting in dense woods often put a variety of leaves with their ghillie suits – so they will smell more natural. Your mother provided excellent hunting training when she chased you to the bus, waving your mittens. Sweet thing that she was, Mama worried you’d catch cold. Illness is the least of a hunter’s concerns. However, having one’s hands & face (and any other exposed surface) covered is critical because your body reflects light. When a duck is looking down at a marsh and sees a flash of light, he continues on to a safer place. Deer also have an uncanny knack for seeing a single flash and knowing it’s time to move elsewhere. She was really explaining that worn or faded camo does you little good. When the contrast (lights vs. shadows) is gone, so is your protection! If your image isn’t broken up by the lights and shadows, you will be seen. “Don’t be a show-off,” was just your mother’s way of reminding you that shiny objects are seen objects! Like your face – a thermos, rifle scope, watch – has reflective properties. These items should be removed or concealed – either with contact paper or matte tape or whatever. Remember: Your solution must be matte (flat, no reflection) or it’s no good. To be successful in hunting, preparation is critical. Realizing you need to travel back 100 miles to civilization to buy a can opener is a real bummer. Oiling squeaks, gathering hunting supplies and food, checking your weapons – all calls for planning. Game relies on noise and movement to save them from your dinner table. When Mama asked you to look at something “from a different point of view,” she was offering another excellent hunting tip. Hunters are more successful when they are not at eye-level with their quarry. Be up in a tree (10 -12 feet up), or sitting on the ground with your back to a tree. You want to see the “whites of his eyes” before your target sees yours! Be where he doesn’t expect you. I could go on, but I think I’ve proven my point that your Mom was your first hunting teacher! It just goes along with my other hypothesis: Your Mother is Always Right. on December 10, 2009 at 1:30 pm Comments Off on Guess What? Your Mama Was Your First Hunting Instructor! Concealment is an Important Part of Bird Hunting! It is a known fact that concealment is an important factor in duck & goose hunting success. But is camouflage – camo clothing – enough? No, not really. Remember that with a goose or duck’s life on the line, he/she tends to watch for hunters rather carefully. However, to ensure success in hunting ducks and geese, you must control your movement! One of the best way to hide your movements is to use a blind. There are lots of low-cost solutions to the problem of hiding from duck and geese. You just need to look around you and adapt your idea to your surroundings. For instance, if you plan to hunt in a cornfield, use corn stalks as your blind. If you find yourself in rushes — make your blind of rushes! It is important to use natural materials that fit into the environment where you are hunting. Ducks and geese aren’t dumb … and they aren’t about to give up their lives to a dumb stunt like sitting out in a field, hoping the birds won’t notice you. If you find yourself in a hayfield, gather up the grass into mounds and crawl into the center. If you hunt in the same place each year (lucky you), it helps to prepare your blind early and set it in place, so the ducks get used to seeing it. Your boat should be camo’d for two reasons. First, birds recognize boats as objects of the enemy. Second, allowing the sun to glint off any part of your boat is a dead give-away of your presence. Talking about glinting objects: Is your gun totally matte black? If not, you should acquire some camo patterned matte vinyl material to your gun stock to disguise it from the birds. No matter how creative or expensive your blind, your movements will scare birds away. All the decoys in the world won’t entice game to come down … if they see a moving figure! If you can’t sit still, you won’t be a success in bagging your limit of birds. Full Disclosure: Although I sell blind materials, I will not mention them in this article. My mission in this blog is to share information. 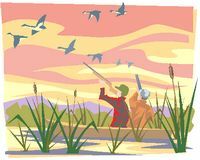 Decoys Tell Ducks Flying Overhead, "Yum, there's plenty to eat here." 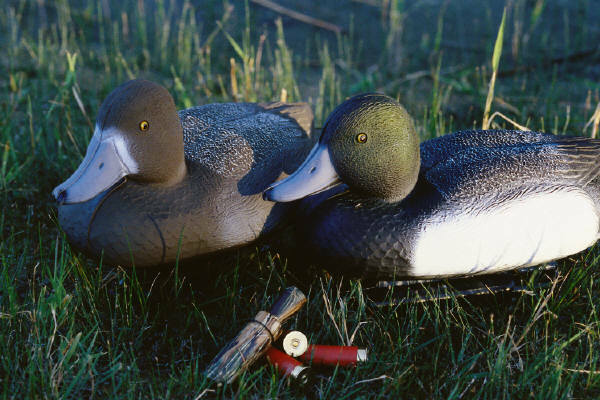 Even if your budget is tight, a few decoys are important to any duck or goose hunter. MDH,* in the early days, had a few realistic decoys for the edges — and filled in the center of his hunting area with newspaper or folded diapers! My husband encouraged both of our kids graduate to underwear ASAP so he could have their diapers for decoys! When Richard started hunting, painting your own decoys was the standard! Will you be able to carry them where you need them freezing rain? Most people look at price and the decoy’s looks without considering how easy the decoys are to carry and/or move around. This is a mistake. You will have plenty of time to kick yourself for a poor choice (of heavy, odd-shaped, ineffective decoys)! Before dropping a wad of money in your sporting goods store, ask around. What types do others feel are worth the money? Is there any place these decoys are ineffective? Must you have a lot of them to have a convincing stand of decoys? More Soon: I’m flying today and hope to write more tomorrow! Re-reading the two posts regarding “gamy taste” in wild game, the tone of the pieces seem to be focused on venison. Perhaps a few words on wild ducks, wild geese, wild turkey, wild fowl, would be appropriate. In truth, wild duck, goose, turkey, etc., have a different taste than domesticated (the ones you can buy in the frozen meat cases). Wild game has not been ‘fattened up’ for the market, nor has it been fed special foods – and diet truly does affect a bird’s taste. The ‘wild ones’ symbolize “what-you-see-is-what-you-get.” And that is the beauty of wild game – no hormones were added – it is just natural food. Because wild game has not been fed a diet of fats and things you cannot pronounce, it tastes dry. Before freezing, quail may be skinned or plucked. For more moisture and flavor, pluck, rather than skin. Quail can be kept in the freezer (at 0 degrees) for 9 – 10 months – if placed in vapor/moisture proof containers or wrapping. After dredging quail in flour mixture, fry in hot fat. Brown on both sides. Cover skillet and reduce heat. Cook slowly until tender, ~ 20 minutes, turning once to brown evenly. Serves 4. If your ducks are fish-eating animals, it is best to marinate in wine, buttermilk or vinegar. If the game is an older goose or duck, marinating your animal in the refrigerator for 4 to 12 hours will improve flavor. These older birds respond well to 1/2 tsp. salt and 1 Tbsp. vinegar per quart of water. This mixture will improve flavor and tenderize the flesh. Wild duck, which is a dark meat, is most flavorful when served rare. I’ve found that roasting a duck in a closed pan – after adding a few strips of bacon (across the carcass) – really makes a difference with large and less-tender birds. The only way I cook ducks is with bacon (strips) and/or in gravy. They need the moisture provided by these, plus a closed pan. One thing I forgot to include with the venison info: Venison does not freeze until it cools down below 28 degrees. #1 of 3: Can You Take the Wild Taste Out of Venison? # 2 of 3: Removing the “Gamy” from Wild Game! # 3 of 3: Getting the “Gamy” Taste out of Wild Ducks, Fowl, Etc. Reduce 'Gamy Taste' with These Tips! Where Does ‘Gamy’ Come From? Generally, experts agree that that “gamy” taste is a by-product of improper handling of the game, after bringing the game down OR before cooking. As an experienced deer processor, Dave (of http://www.best-venison.com) has seen it all and has the photos to prove it. Look around his site for other info on reducing gamy taste. Dave indicates that leaving bone-in the venison contributes to the gamy taste. He believes “aging” deer can add gamy taste. See his suggestions. He also indicates anything less than “double wrapping venison” for the freezer is a bad idea. His theory and solutions are too lengthy to cover here, but he has the credentials to know his subject and give great advice. There are many ways to remove the wild taste. At eHow, http://www.ehow.com/how_2067752_get-wild-taste-out-of-deer.html -check out the idea there. Before we fry the backstrap of the deer, we marinate the meat in milk for ~24 hours. Cut up a pineapple – mix pressed pineapple slices, pulp, juice with meat chunks (or slices), cover, place in refrigerator for a couple of days, then use. If you are using a large piece of meat, increase the amount of fresh pineapple. Try venison in tomato-based dishes, such as meatballs and spaghetti sauce, lasagna, chili, etc. The tomato masks (or removes, I’m not sure which) the wild taste.